I figured out the theme early on. It’s a good Monday theme – accessible, solidly constructed, and fair. 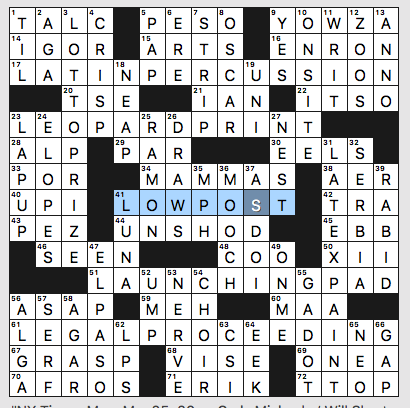 It didn’t thrill me but then I’m not the intended audience for Monday puzzles. There are seven theme answers, which is a lot for a 15×15. I don’t think the fill suffers; I will stipulate that I am less likely to be irritated by fill than some others, so your mileage may vary. 3d [Mega Millions jackpot] is LOTTO PRIZE. This gave me a rare error on a Monday, since I confidently filled in LOTTERY once I had the first three letters. Nope. 17a [Tito Puente’s specialty] is LATIN PERCUSSION. 23a [Material that’s spotted at a fashion show?] is LEOPARD PRINT. I spent the better part of the past three days shopping with my daughter and I am here to report that snake print is big this year. Leopard is out. 31d [Wall covering that’s washable with soap and water] is LATEX PAINT. 41a [Area of a basketball court near the basket] is LOW POST. 51a [Rocket’s takeoff point] is the LAUNCHING PAD. 61a [Court case, e.g.] is a LEGAL PROCEEDING. 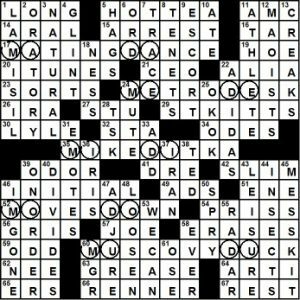 And the revealer: 62d [Old records … or a hint for this puzzle’s seven longest answers] is, as you’ve probably realized, LPS. 1a [After-bath powder] is TALC, but it shouldn’t be. 9a [“Holy moly!”] is the entertaining YOWZA! which always takes an exclamation point. 34a [Mothers, informally] is MAMMAS, although I hear “madre” a lot among my kid’s friends. 24d [Gets hitched in haste] is ELOPES. Is it always in haste? I think sometimes people elope to get out of the big wedding drama, but maybe I’m wrong. 68a [What you might use to get a grip on something] is VISE. I put in VINE at first, thinking of getting a grip as you climb a mountain in the jungle….never mind. What I didn’t know before I did this puzzle: that the area of a basketball court near the basket is the LOW POST. Baseball, sure. Anything else, not so much. 17a [Peacock courtship ritual] MATING DANCE–This colorful phrase gets 600,000 Google hits, yet doesn’t show up in a dictionary? 24a [It has a finger on a city’s pulse] METRO DESK–This phrase’s roots are in old-school newspaper work-space layouts, no? I’m surprised that it is not in a dictionary, whereas city desk is. 100,000 Google hits, though. 35a [“Iron” Bears coach] MIKE DITKA–One of the most colorful and successful football figures ever. No need to look him up. 52a [Goes from No. 1 to No. 2, say] MOVES DOWN–Farlex’s Free Dictionary carries move down as an idiom, but mow down is in several dictionaries, and MOWED DOWN ought to have worked, I think. 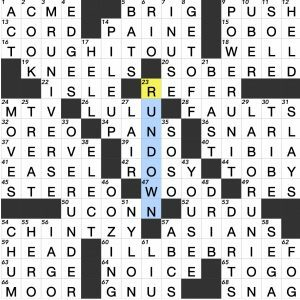 60a [Red-faced fowl] MUSCOVY DUCK–This dark-crested water bird of Central and South America hereby makes its crossword debut. A tip of the hat to C.C. and Steph! All I can figure out for the order concept is that the theme answers are … in order, and that makes me wish that 39d [Not in stock yet] ON ORDER could have been IN ORDER, clued as either a reveal or a bonus. This nicely built grid also gives us HOT TEA, I-TUNES, ST. KITTS, LAMISIL, ORATORY, MESS KIT, I’M GONE, and ADJURE. Good fill! Lots of clever clues. Nice job, folks! 4 stars. 23d is clued [Seedy, and an apt description of a word hidden in 3-, 9-, 29- and 33-Down], the answer being RUN DOWN. Each theme answer has the letters RUN spanning a two-word phrase. 9d [Watt, for one] POWER UNIT. Hmm. This one gets the side-eye from me. Not a strong in-the-language phrase like the others. Works well enough, I suppose, but if you’ve seen this type of theme scores (hundreds?) of times, it’s hard to get excited about it. 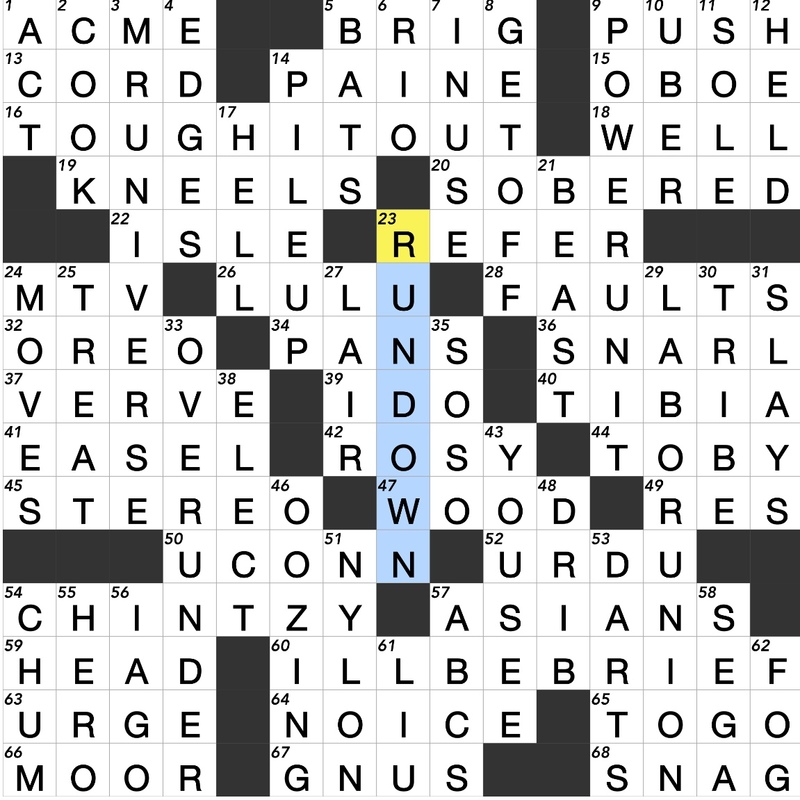 Still, this is a good theme for someone new to crosswords. Frankly, I must not have been paying much attention during the solve since I was trying to watch the telly at the same time, but looking back over the grid, CHINTZY, TOUGH IT OUT, and “I’LL BE BRIEF” stand out as the funnest fill. I also liked seeing TOGO clued as [Country between Ghana and Benin]. Fantastic themeless offering from BEQ today. Hit more than a few walls, but it made that feeling of accomplishment when Mr. Happy Pencil makes an appearance all the better. 37D [Manicurist’s target] HANGNAIL. Eeew. I’ve never been to a manicurist. Next time I get a hangnail perhaps. 36D [“Harumph!”] THE NERVE! Incorrectly parsed it as THEN ? ?VE and really wanted THEN LEAVE! 38A [Question to someone acting really strangely] WHAT ARE YOU ON? Great entry. 36A [It leads to home] THIRD BASELINE. The I in THIRD helped me change the crossing answer from APART to SPLIT. 31A [Neighborhood stack spot] LOCAL LIBRARY. The LL in the middle made this one tricky for me. 23A [Actor whose name anagrams to a word meaning “wins over”] ED ASNER. The anagram in question is ENDEARS, though I can’t imagine that helped any solver figure out the clue. 12D [Song that knocked “Papa Was a Rollin’ Stone” out of the #1 spot in 1972] I AM WOMAN. Fun fact. 15A [First warning] ONE STRIKE… STRIKE ONE feels more familiar. Things I didn’t know like KRAUS, MOL, SALA were all fairly crossed. Very hard to complain about anything in the puzzle. I spent most of my time in the NE, where I tried a variety of different answers (I’M A WOMAN for I AM WOMAN, ELMER for SAMSA (makes sense, sorta! ), DOPE for TWIT, SWATH for HEATH. Eventually it all came together in a very satisfying click. 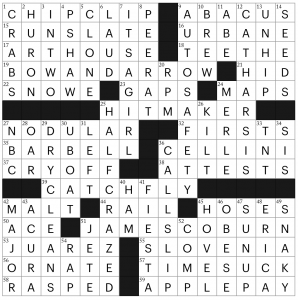 I forgot to note which clue/answer was highlighted by the magazine on solving the puzzle this week, so we’ll focus on what clue felt the most New Yorker-y to me. That typically means a highbrow humanities thing outside my normal sphere of knowledge, which means this week’s clue is “Florentine sculptor of ‘Perseus with the Head of Medusa’“. That sculptor would be Benvenuto CELLINI, one of the most important artists in the Mannerist style. That’s about as far as I can get without needing to directly quote Wikipedia/other sources, but it’s some impressive bronzework. “One left holding the bag?” was a lovely clue for CHIP CLIP, though my favorite clue this week was “Tell-tale items?” for BOW AND ARROW. Another standout: “Future output” for RAP. Fill was also up to Patrick Berry’s smooth standards – RUNS LATE (which I initially had as RUNS LONG), URBANE, ART HOUSE, NODULAR, JAMES COBURN (who, it turns out, served as a pallbearer for Bruce Lee along with Steve McQueen), TIMESUCK, APPLE PAY, IT’S A GIRL, AUTO SAFETY, HALF CRAZED, and CALL SLIP. No GAPS here – just smooth sailing. Y’all, I just left ACPT 2019 and it was a blast! The folks of CrossWorld really are the most lovely, genuine, earnest, nerdy, and wonderful people, and I feel so enriched from hanging out with them this weekend. If you ever have a chance to go, you should. I was one of 200+ rookies this year among the field of 700+ total competitors, and you can be part of that fun group next year! Fun! 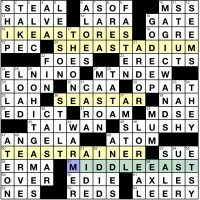 Each entry splits the word EAST across two words, and specifically as _EA ST_. (Bonus points for HALVE as a grid entry.) This is really cool since there aren’t that many words that end in EA and not that many in-the-language phrases or ideas that could be used as themers. Brava! Also, there are some great women in this grid: “Good Morning America” co-anchor LARA Spencer, ANGELA Merkel, ERMA Bombeck, EDIE Falco, AVA Duvernay, SARA Lee, and Irene CARA. All that’s missing are woman-centric clues for SUE and MUM. That’s all for now – time to hop on a flight back to California. Take care! This entry was posted in Daily Puzzles and tagged Andrea Carla Michaels, Brendan Emmett Quigley, C.C. Burnikel, Kevin Christian, Patrick Berry, Stephanie Kim, Zhouqin Burnikel. Bookmark the permalink. I just made a comment and it disappeared. TPTB didn’t like it? Madre is not informal though, that would be Mamá. My one objection is about SAN RAMÓN being a suburb of San Francisco. Not even remotely; not even a suburb of Oakland. Would a city in Suffolk County be considered a suburb of NYC? I think a case can be made that any city within commute distance of a major population center can be called a suburb. The vast number of NYC workers who live in Suffolk and take the LIRR qualify. And I’m sure lots of San Ramonians get dropped off at the Dublin BART station to head into SF. As with New York, Bay Area housing costs are so unreal that people are forced to live in ever-more-remote suburbs. Of course, based on population, we should be talking about San Francisco being a suburb of San Jose. As a long-time Californian, I am sticking to my opinion. 1. I lived in the Bay Area for many years. No one ever thought of San Ramon as a “suburb” of SF. 2. People routinely commute to SF from Davis, CA and also the Sierra foothills. Are they suburbs? No. 3. Even Oakland would be a stretch to define as a suburb of SF. 4. I realize it’s but one dictionary, but I’m going with the OED’s definition: The area immediately outside a town or city; the area belonging to a town or city that lies immediately outside its walls or boundaries. I’ve been living in San Francisco for 7 years now. I’ve never heard San Ramon described as a suburb of SF. I realize “madre” is not informal in Spanish. It seems to be a current trend among Anglo teens/young adults and is informal in their English speech. It makes me a wince a bit because it feels like cultural appropriation. My kid hasn’t used it (at least not to my face). And my time in the SF Bay Area was nearly 30 years ago. I remembered that San Ramon was in NorCal and didn’t think twice about whether or not it was a suburb of SF; looking at the map and casting my mind back, I agree with Zulema. I’d call San Ramon an exurb, not a suburb. It’s been a place where commuters to SF live for years [1960 by my own memories] but less so now that it has its own business parks and it might be more a suburb of Walnut Creek than San Francisco at this point. I had San Mateo [which was also a stretch but not quite as far] at first, but crosses wouldn’t fit. Thanks again to David for preparing a special version of the Universal with circles, exclusively for us. 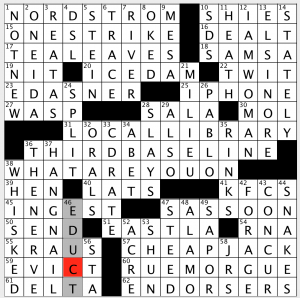 Syndication doesn’t support them, so newspaper solvers have to deal with a longish and less elegant clue construct. We get a much better solve. no comments about the acpt? Patrick Berry’s New Yorker puzzle: excellent, as always. I agree that terms like “Bay Area,” subub, exurb and bedroom community are a bit vague, but the sense of “within commute distance” (which is found in M-W) covers a multitude of sins. Here San Ramon is #12 on the list of 2019 Best Suburbs to Raise a Family in the San Francisco Bay Area. Beq – challenging but not obscure. Satisfying as the reviewer said. This was a rare 5 for me. New Yorker 19A: what’s the relationship between “tell-tale items” and “bow and arrow”? Thanks. A [William] Tell tale …. Oh, got it now! Thank you very much Norm.